“I am amazed by the conceptual clarity the rock solid foundation if his fifty years of experience in teaching Dravyagunavignyan, as well as his rich interaction with other scholars shines through. The author had the good fortune to be born as a son of Vaidya Mahadev Han Gogte, in a long family tradition of Ayurveda. He had academic experience, as a teacher in Ayurveda, of over five decades, He lived in areas where tribal medicine abounds and enriched himself by the field experience of extensive tracks in the hills, with experts on medicinal plants. Hence he had a cumulative experience and health-wisdom of half-a- century, which he shared with the world, through this textbook. Besides, he held important public positions in Ayurveda Seva Sangh, Maharashtra State Vaidya Mandal, Sarvajanik Vachanalaya (Public Library), Spring Lecture Series, Maharashtra Science Congress, Municipality, Homeguard, Civil Defense etc. His inspiring presence at the Conference organized on “Selected Medicinal Plants” by Bharatiya Vidya Bhavan’s SPARC and CHEMEXCIL, led to very fruitful and practical dialogue. This later led to major publication, which has put India on the global map of useful medicinal plants. 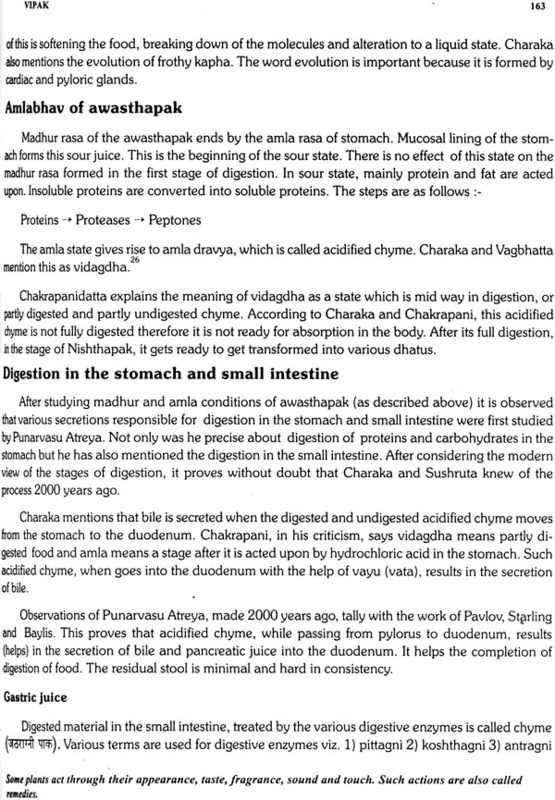 Vaidya Gogte also gave lectures on Ayurveda and Dravyagunavignyan in Europe, which were very erudite and appreciated. He was closely associated with many of his contemporary eminent vaidyas, ethno botanists, pharmacologists, pharmacists, forest officers, Micas leaders, doctors etc. He, with an unmatched modesty, gave credit k many of his colleagues for the Tex look out Ayurvedic Pharmacology. 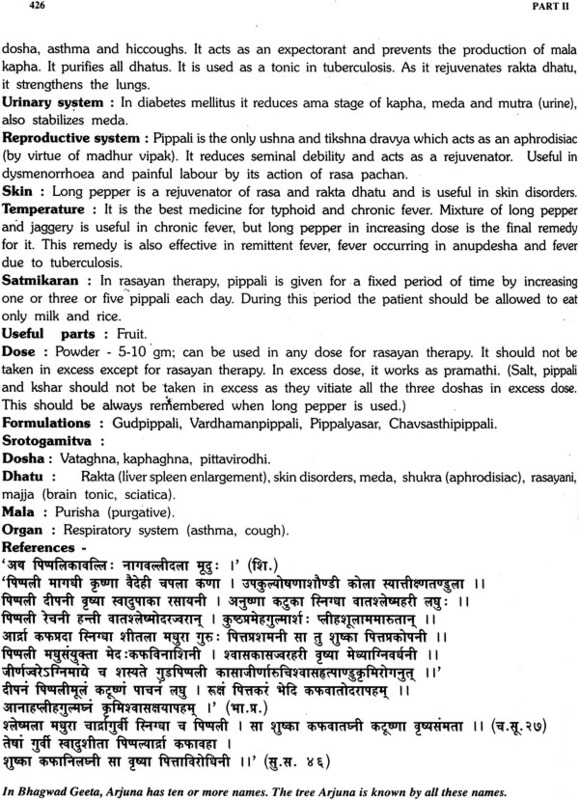 The in depth knowledge of the subject of Dravyagunavignyan (Ayurvedic Pharmacology) of vaidya V. M. Gogte made the Marathi edition extremely useful, for around tow decades, as a reference tectbook to students of Ayurveda. Recognising the emerging glonbal importance of traditional medicine and with a view to propagate the unique, comprehensive and sound concepts and teachings of the author, the Academic Team of Bhavan’s SPARC undertook the translation of his work. 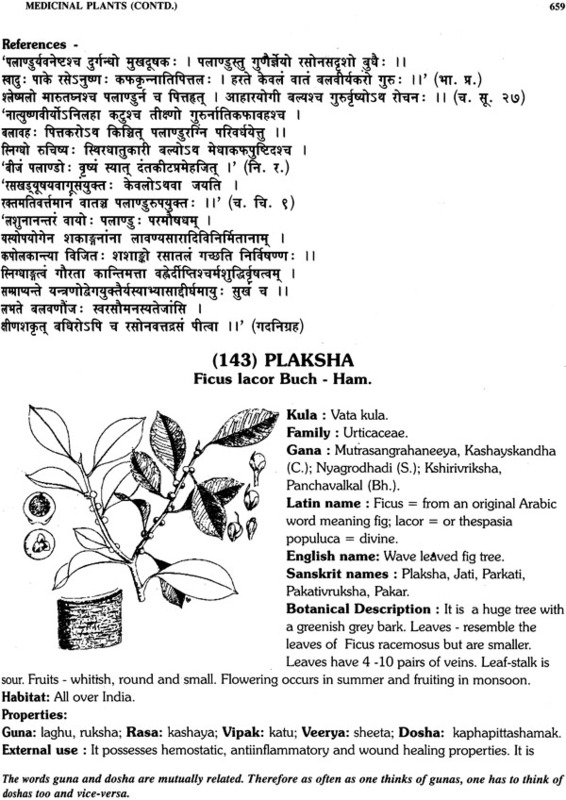 This book contains the fundaemtals of Ayurvedic Pharmacology and properties and uses of medicinal plants. 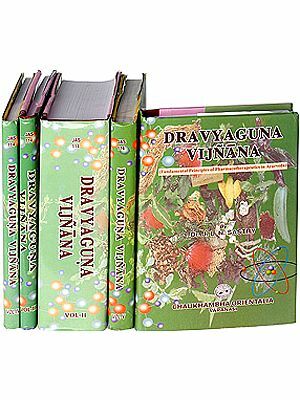 The first part of this volume, in 284 pages, deals lucidly with the basic principles and concepts of Ayurveda and Dravyagunavignyan. 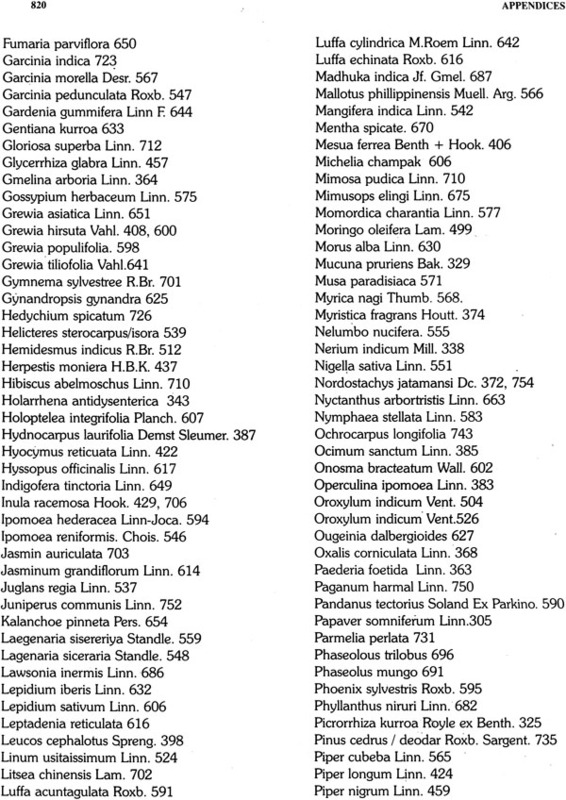 The remaining parts comprise of details and sketches of 368 medicinal plants alongwith their names. 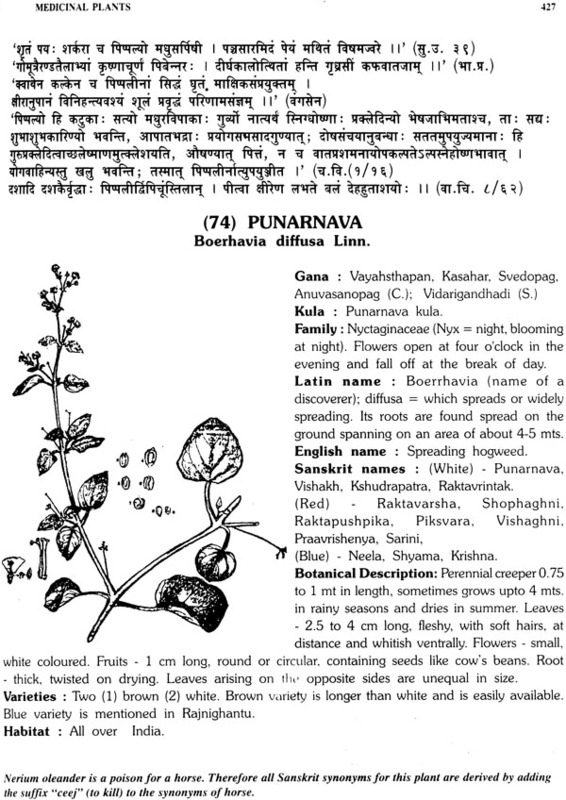 Habitat, botanical description, chemical constituents, Ayurvedic. Properties, pharmacology, formulations, dosages, medications etc. The present volume by Vaidya. V. M. Gogte is a timely reminder to all pharmacologist and physicians that the men of renaissance lead us to intelligent correlation between ancient intuitive insights and modern discoveries of science. All the scientists, physicians, vaidyas and students interested in “Green medicine” will find a great friend, philosopher and guide in the form of this textbook for data-mining for new remedies and new uses. Many golden nuggets await the industrious, persistent and seeking minds. Ayurvedis the art-science of health care, from India. It has been preserved, developed and now being globalised. The founder of Ayurveda - Lord Dhanwantari — manifested from the ocean, with Amritam (elixir of immortality) in one hand and Amrita (the plant — Tinospora cordifolia) in the other. From such an antiquity, India’s quest for healthy life-style has centred around Nature and her rhythms. India’s seminal contribution to the world of science is not only the discovery of zero and the decimal system, it has also been in the field of health-giving foods, medicinal plants, animal products and minerals. The world is waking up to the vast pharmacopoeia of Ayurveda. “That is called a sutra, by the knower of sutra, which has the least number of words; it is unambiguous, synoptically, all-embracing, devoid of redundant words and faultless”. But it is difficult for those who do not know Sanskrit well to be able to read, grasp and utilize gainfully the capsule health wisdom in Sutras. Hence the masters in Ayurveda, from time to time wrote commentaries, explanations and translations to make the process of learning Ayurveda easier. Vaidya V. M. Gogte belonged to this rich tradition of great teachers in Ayurveda. His book - in Marathi - of Dravyagunavignyan has been a popular text, in Maharashtra and for all those who know Marathi. But it was felt that an English translation would be of great value for service, education and research in global Ayurveda. Hence I first suggested to his daughter Dr. Jaya Gogate that the Bhavan’s SPARC team and others should embark on this difficult but useful venture. 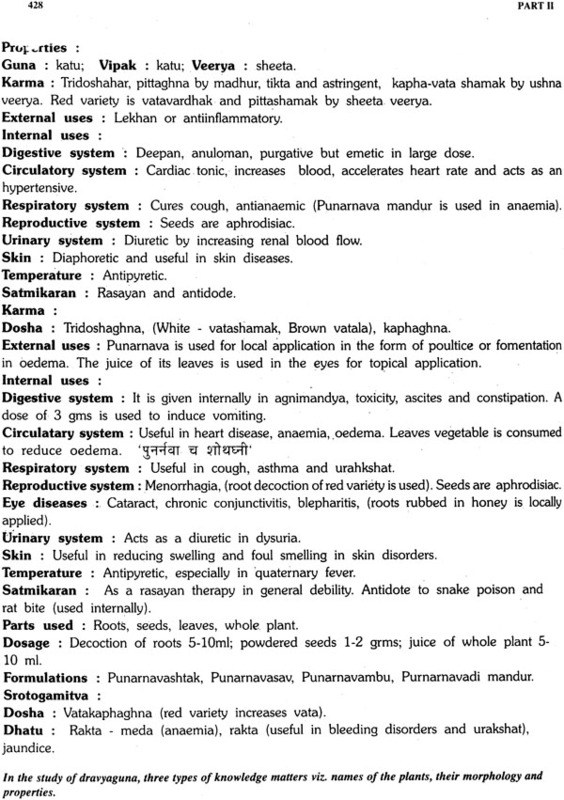 We are happy that several years’ efforts of the team have now provided this English translation — Ayurvedic Pharmacology. 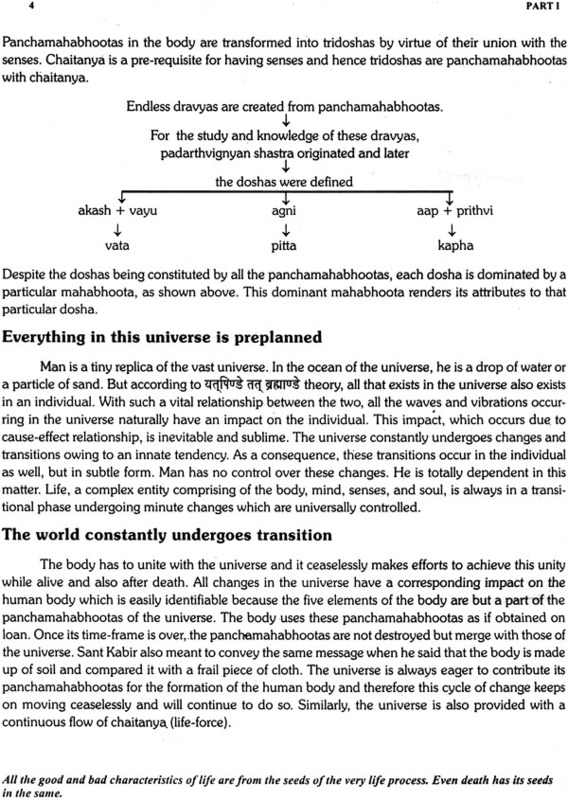 “Prakriti to Mahat then Ahankar (ego) and the sixteen gunas; from this sixteen are five- derived five bhootas (elements)” So Purusha (self) and Pralcriti (nature), Kshetragnya (knower of the field) and Kshetra (field) constituted the primordial sources for the genesis and evolution of Mahabhootas and the resultant dravyas. 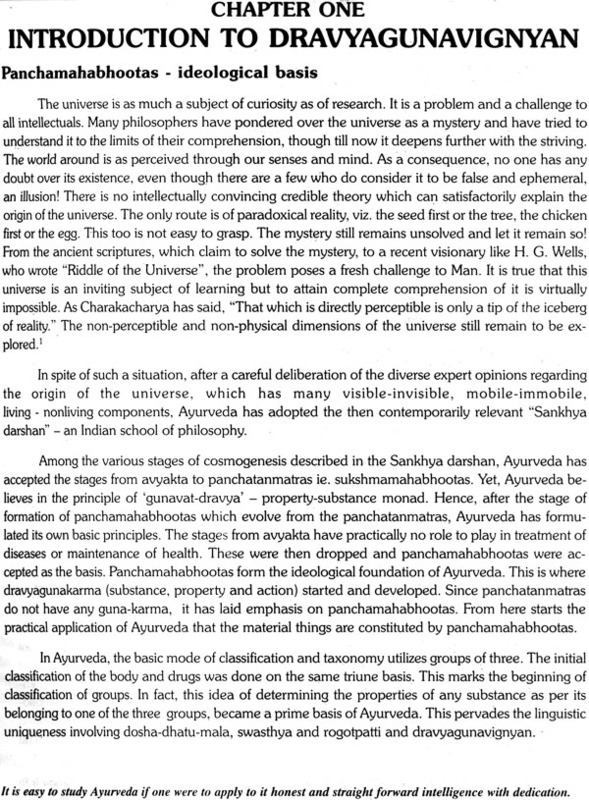 In past it was a practical approach to incorporate the contemporary dominant philosophical system (Sankhya) as a foundation of a healing system. But what Jung calls “walks on the earth with naked feet” was also a bit lost in the abstractions of Sankhya and Panchikarana — five-fold genesis of materials. While India was chafing under the foreign rulers, Ayurveda was ignored and derided too. The revolutions in physics, chemistry and biology almost went unnoticed by Dravyagunavignyan textbooks. The periodic table of elements, the structure and fission of the atom, the nature of the chemical bond, quantum chemistry, structure-activity relationship, pharmacokinetics and the central dogma of molecular biology etc. 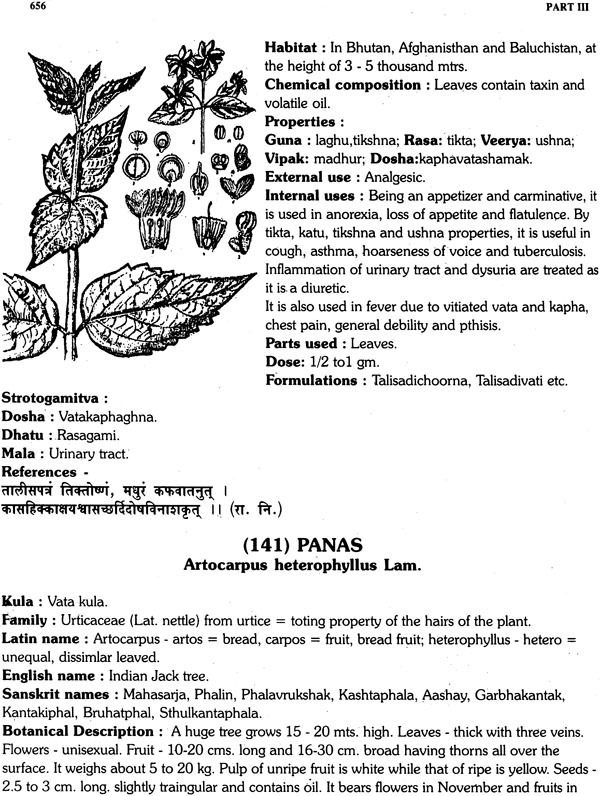 were and are still nonexistent in classical textbooks of Ayurvedic Pharmacology. 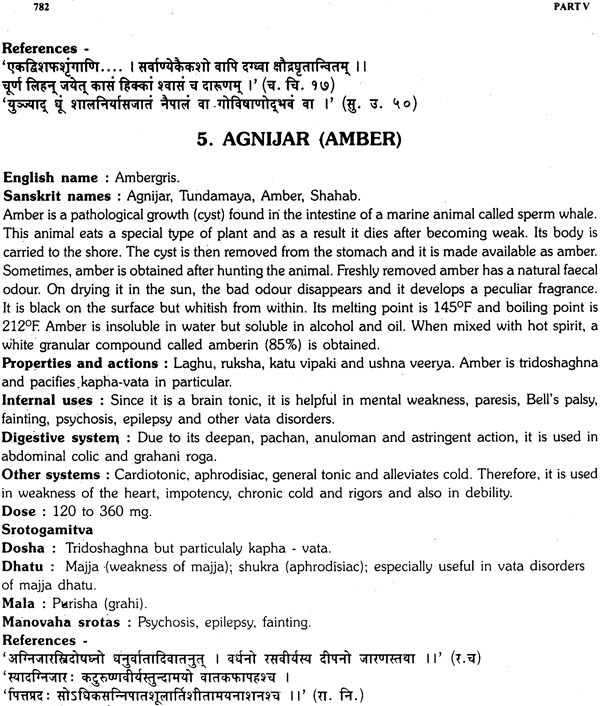 But similarly, Rasa, Guna, Veerya and Vipak are absent in textbooks of Allopathic pharmacology. Are there any meeting grounds for a dialogue between these two separate ways of looking at the properties of useful remedies? There is an urgent need to list, debate and identify how reductionism and holistic modes of conceptualization and experimentation can judiciously be integrated for a better scientific understanding of drug action. 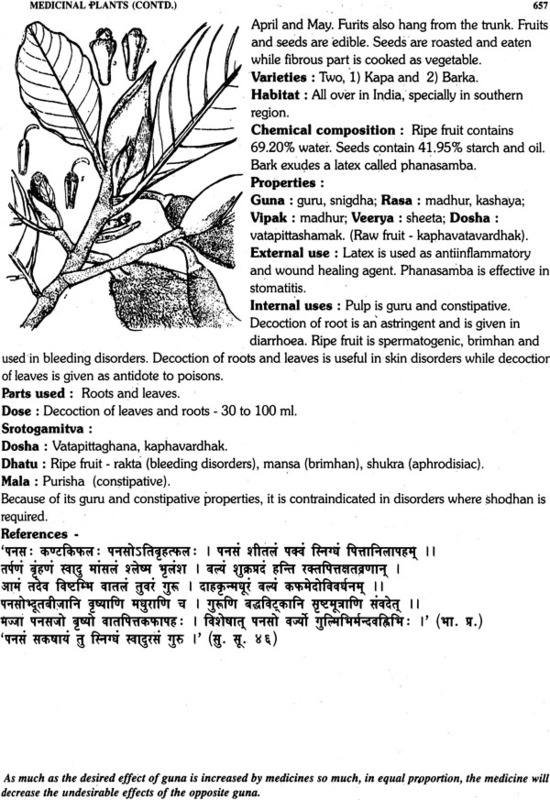 For example, Rauwolfia serpentine served as a unique remedy from Ayurveda, which opened up new fields in basic and applied research in hypertension, depression and Parkinson’s disease. Many such opportunities for research are described in the present textbook for the fundamental pharmacology and the remedies. The present volume by Vaidya V. M. Gogate is a timely reminder to all pharmacologists and physicians that the men of renaissance lead us to intelligent correlation between ancient intuitive insights and modern discoveries of science. The data on medicinal plants in the textbook have been a source of inspiration for the ongoing research at Bhavan’s SPARC. 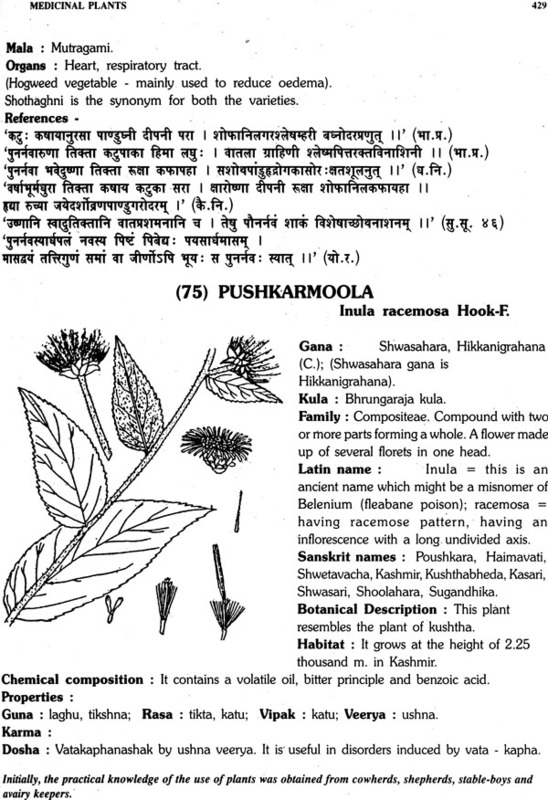 It helped a lot in our compilation of the monograph on Selected Medicinal Plants of India. Gogteji, during his last years, was very happy the manner in which the multidisciplinary team at Bhavans SPARC, conducted research on medicinal plants. He would have been pleased to learn how this work has progressed: (1) Mucuna pruriens for Parkinson’s disease (2) Picrorrhiza kurroa for viral hepatitis (3) Curcuma longa as antimutagenic/cancer preventive (4) Saraca indica as antimenorrhagic (5) Panchvalkal as wound-healing agent and (6) Volatile oils of spices as antimicrobials. All the scientists, physicians, vaidyas and students interested in “Green Medicine” will find a, great friend, philosopher and guide in the form of this textbook for data-mining for new remedies and new uses. Many golden nuggets await the industrious, persistent and seeking minds. For us. 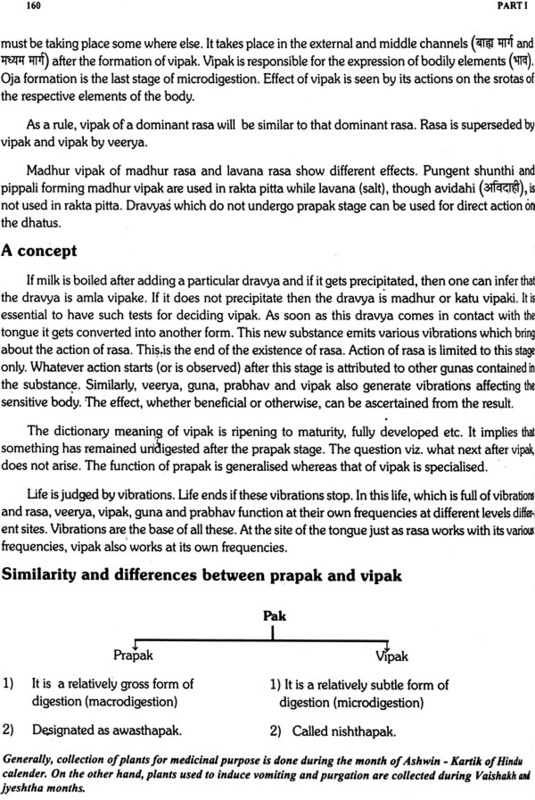 Over the years, this textbook in Marathi had served as an authentic reference. May many more who needed an English translation too derive benefits for research and therapeutics. For this mammoth effort, the suggestions and guidance provided by Sri C. Subramaniam, the Bhavans President, Sri S. Ramakrishnan, Executive Secretary and Director General and Sri Dhiru Mebta, Hon. Jt. Director of Bhavan have served as an inspiration to the Academic Team of Bhavan’s SPARC, in the challenge of the work of translation. 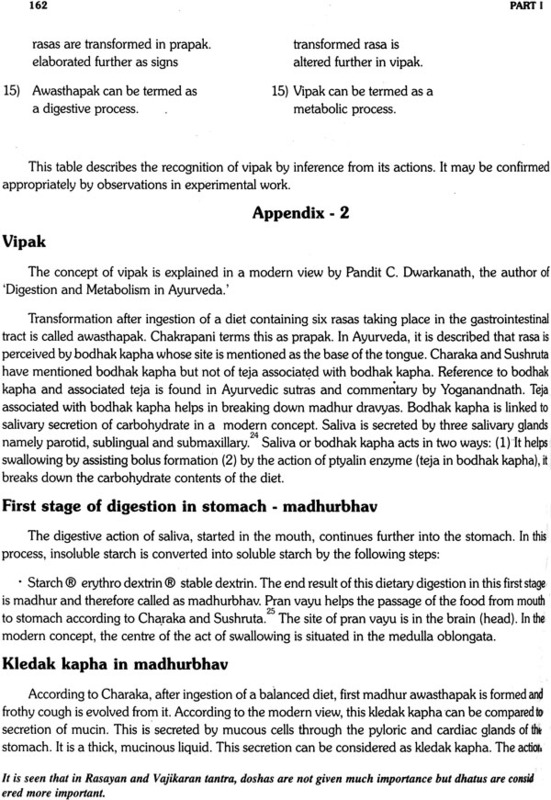 We are also deeply appreciative of the brief opinions about the textbook, expressed by the eminent leaders of medicine, Ayurveda and phytopharmacology: Dr. P K. Warner, Dr. S. A. Dahanukar, Dr. S. S. Handa, Vd. D. S. Antarkar and Dr. B. M. Hegde. Ayurveda, like the vedas, has existed and has been committed to memory in India since prehistoric times. Today, many institutions are engaged in teaching Ayurveda, either in its original form or integrated with modern medical subjects. People have been studying Ayurveda owing to their innate motivation as well as for the benefits derived thereby and this will continue in the future too. For hundreds of years, Ayurveda shouldered the responsibility of treatment of diseases and maintenance of health in India. It has admirably proved equal to this responsibility. Notwithstanding the creditable performance, India, a multigeoclimatic sub-continent which was frequently invaded and fragmented, could never have a standard curriculum for the study of Ayurveda. Although the same textbooks were used, in a country like India, with different climate and conditions from Kashmir to Kerala and from Saurashtra to Assam, there was a marked diversity in Ayurvedic education and treatment methods. Different states had varying syllabi. As a consequence, Ayurveda was never able to achieve a consistent and organized image in the minds of the people. Barring a few exceptions, this led to a negation of Ayurveda. What was needed was organized unity of this science of health. Even though based on firm philosophical foundations and its practical utility in day-to-day life, Ayurveda was neglected. Ayurveda had once treated and maintained health for 80% of the population. It was realized that to make Ayurveda again acceptable in the present day situation, it was extremely important to have a unified approach. With this aim, efforts were made throughout the country and a committee set up at the administrative level, which initiated work in this direction. This committee, known as “Central Council of Indian Medicine”, outlined a common syllabus so that all over India, a uniform education in Ayurveda would be imparted. Accordingly, acclaimed authors were asked to write books in their respective subjects. After evolving a common syllabus, the need for having text books in thirteen to fourteen Indian regional languages arose. “Dravyagunavignyan” is one of the important subjects included in the syllabus. 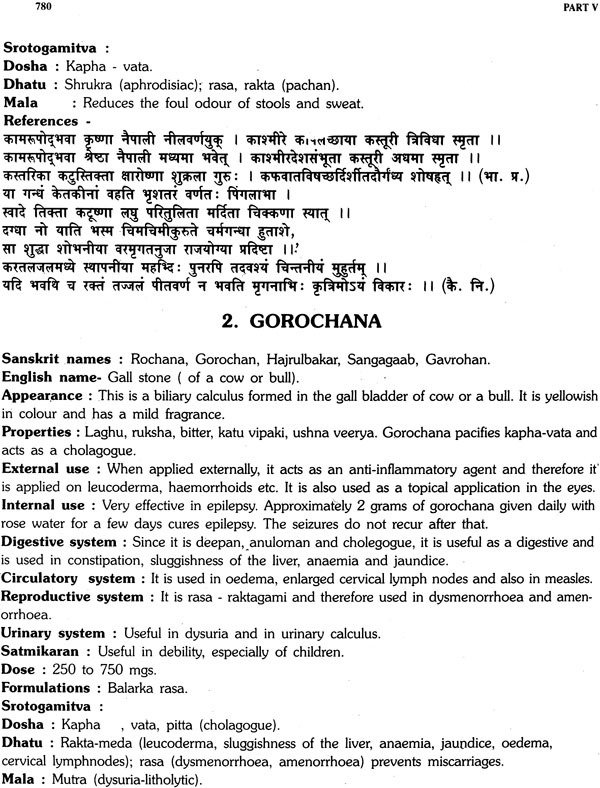 It was the need of the hour to have a book on this subject, in Marathi, which would include the basic principles of Ayurveda, as found in the original texts, as well as experiences derived from generations of use of Ayurvedic medicines. Vaidyaraj Bhalchandra Nanal, a member of the “Central Council of Indian Medicine”, requested me to write a book on “Dravyagunavignyan” in Marathi, as he was acquainted with my work. I accepted the offer. It was in June 1973, that I started working on the book. After 26 months of continuous work, it was finally completed on 15th August, 1975. Before getting the book published, I thought it extremely important to have it approved by leading professors in the subject. The idea behind this was to overcome the shortcomings, resolving of perplexities and integration of new thoughts. For this purpose, a workshop was organised which consisted of two senior professors each from every Ayruvedic college in Maharashtra. During this three day workshop, approximately thirty professors had lively discussions on the subject, provided valuable suggestions and finally approved the book. This contributed substantially towards the authenticity of the book. 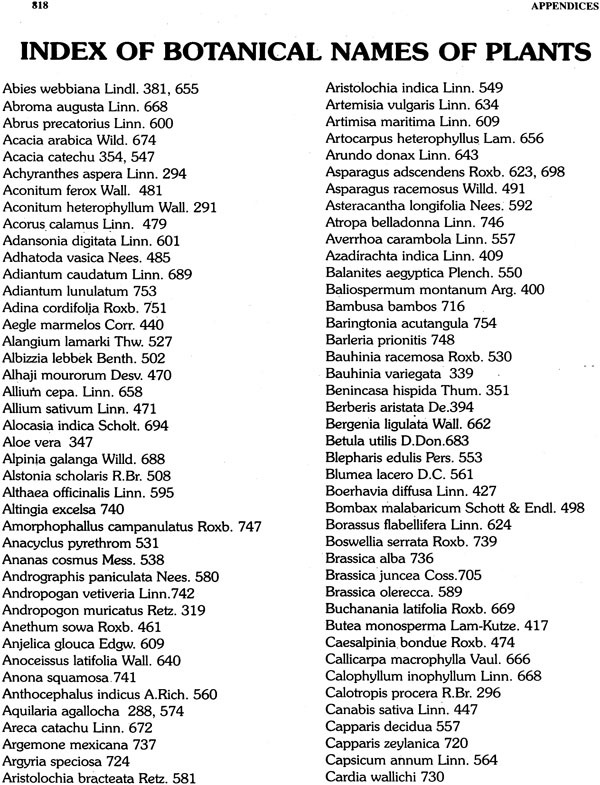 This book contains sketches of almost 350 plants. 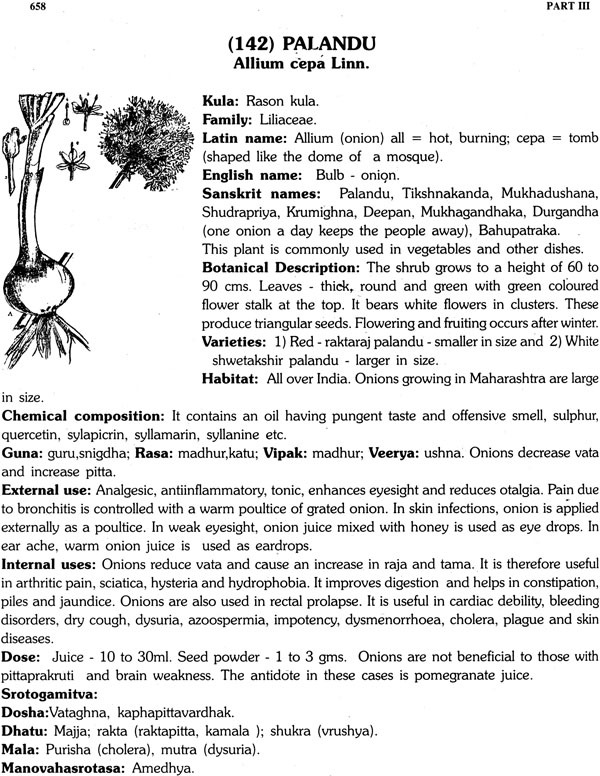 References are provided from Ayurvedic texts. 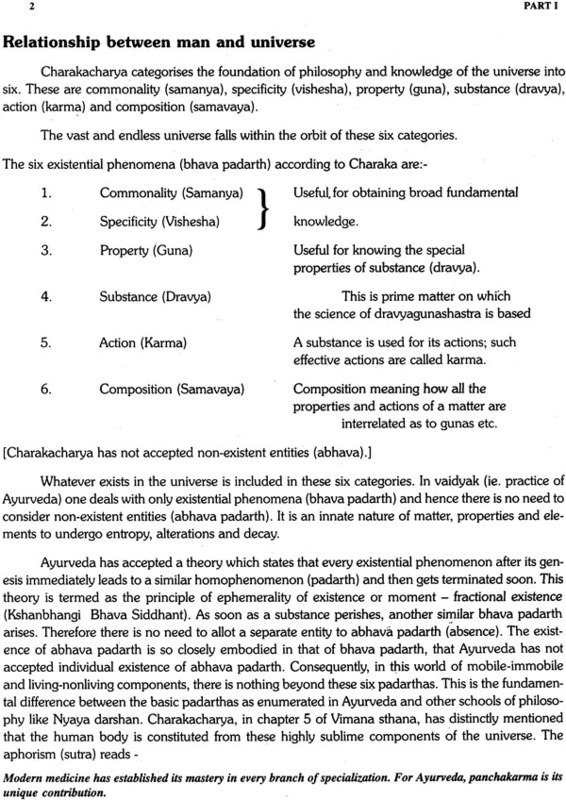 Out of the total number of pages, 284 pages have been devoted to principles of Dravyagunashastra. In the remaining part, medicinal plants, .their Sanskrit and Marathi names, sketches and their kulas and families have been given. 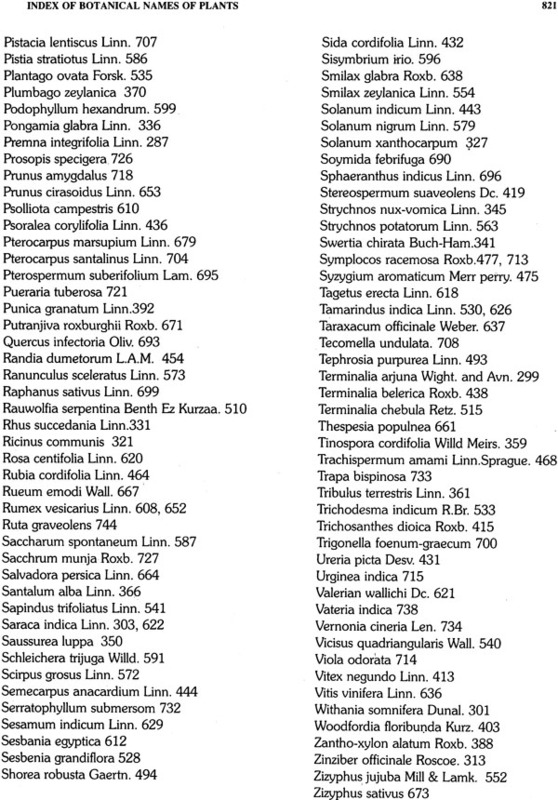 Latin names of the families have been provided along with their meaning as also the universally accepted binomial nomenclature. 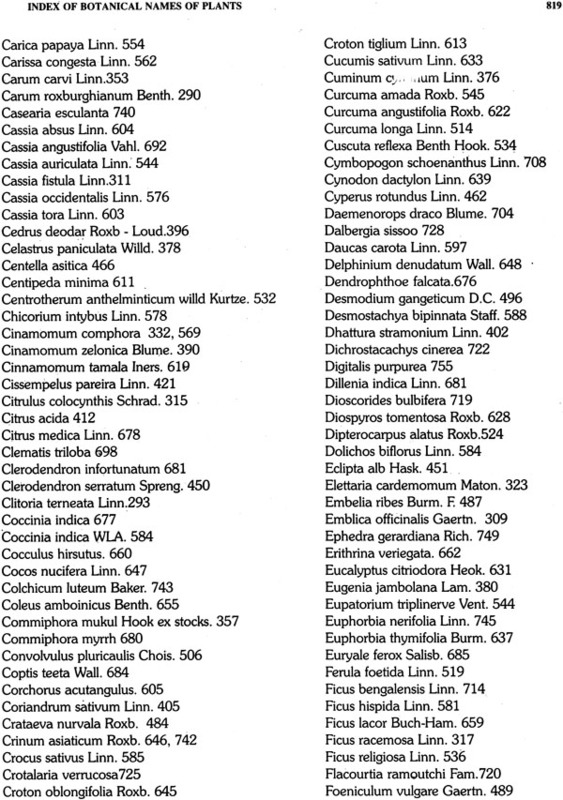 Further, the Sanskrit synonyms, botanical description, chemical composition, properties, uses in various diseases, parts used, doses and formulations of the plants have also been described. 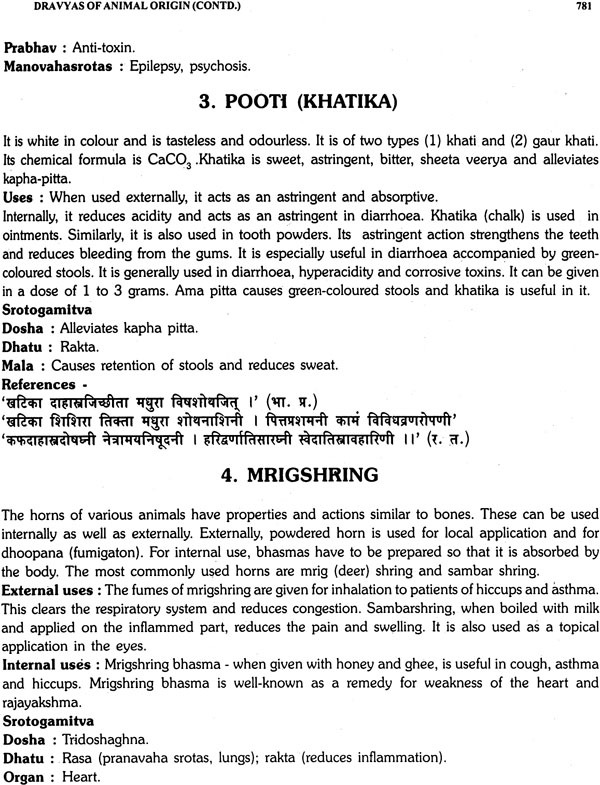 Lastly, the dosha, dhatu and malagamitva of the herbs have been given. Every page in the book carries a foot-note. 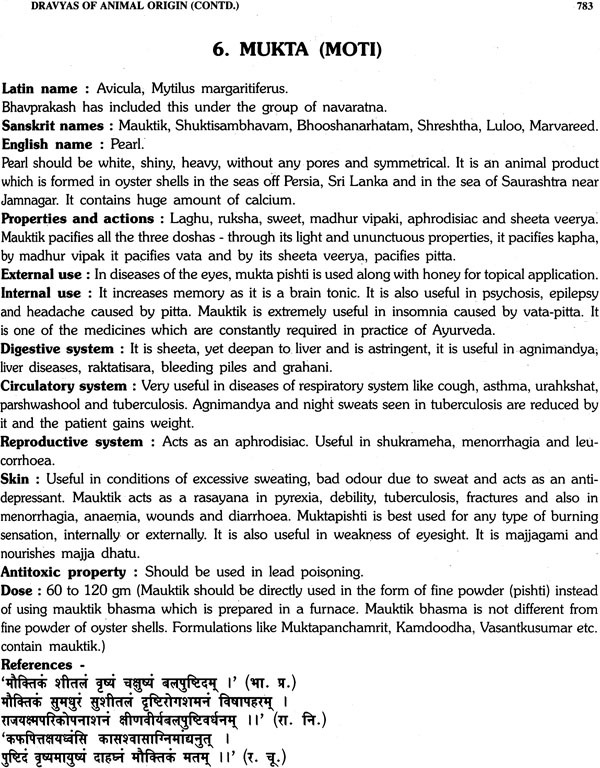 These foot-notes, concerning every branch and section of Ayurveda, provide seminal material for thought and meditation. Many were drawn to this imaginative deployment of foot-notes. It has been my experience that these foot-notes convey the message far more effectively without the reader being burdened by volumious reading. 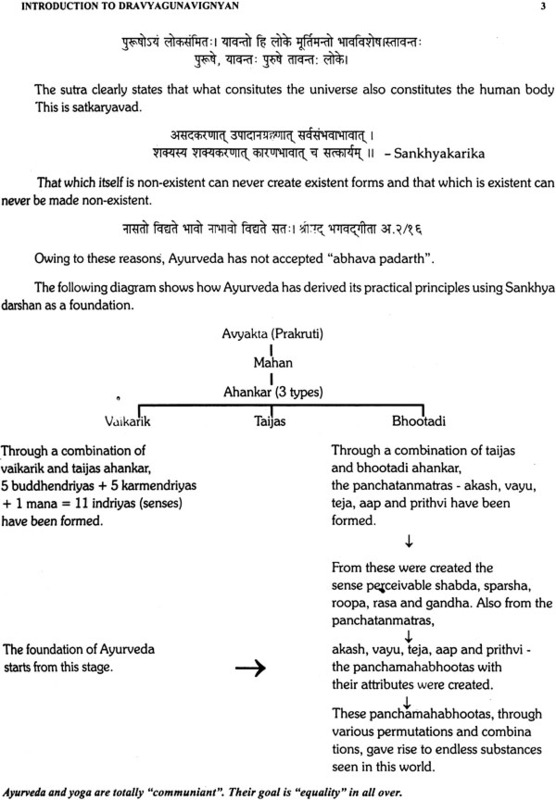 This was the reason for providing foot-notes which elicit the basic principles of “Ayurveda - darshan”. Through this book, students, teachers, practicing vaidyas and even a casual reader will definitely grasp the fundamentals of the subject. Presently, many books are available on “Dravyagunavigynan”. Nevertheless, I am confident that this book, which is an extract of almost 50 years of my teachings on the subject, will fill the vacuum created by the lack of such a book. Moreover, information provided in the form of illustrations and pictures will be easily grasped by students. Nobody can attempted knowledge in any subject. The author is no exception to this rule.